Google Now delivers customized cards, based on information from your Google services (such as locations, searches, web history, Gmails, and calendar events) and from third-party products that you allow Google to access. For example, you may get traffic reports before leaving for a dentist appointment, or receive train arrival times while waiting at the station after work. View your team's scores on game days, or find popular restaurants when you travel. Set up your Google Account (if not already done) by touching Apps > Settings > Under Accounts touch Add account. You must use a Google account for Google Now to work. Swipe up from the navigation bar at the bottom of any screen. 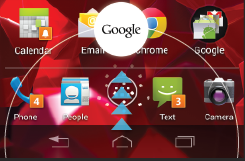 Or touch the Google search bar on the home screen. When a card has a new update, you’ll receive a notification at the top of your screen. You can pull down the notifications shade to open the card or dismiss the notification. For some cards, you can touch the card for more details or to take action, like check into a restaurant. When you are finished with a card, swipe it left or right to dismiss it. Touch Settings on the card. From the bottom right corner of the Google Now screen, touch Menu Settings > Google Now, then touch the card you want to edit. Adjust the card settings, or turn the card off or on. Turning off Google Now stops the display of cards and returns Google Now settings to their defaults. Scroll to the bottom of the Google Now screen and touch Menu > Settings > Google Now. Touch the on/off switch to turn off. To restart Google Now touch the on/off switch to turn on. Sports information [team’s name] "San Francisco Giants"
Pictures "Pictures of" [topic] or "images of" [topic] "Pictures of San Francisco" or "Images of cats"
Convert measurements [original measurement] "in" [new measurement] "30 degrees Celsius in Fahrenheit"
Movie showtimes "Movie" [location] or [movie name] "Movie Chicago" or "The Horse’s Mouth"
Word definition "Define" [word] "Define campanile"
Weather forecast "Weather" or "Weather" [location] "Weather" or "Weather Detroit"
Identify an area code "Area code" [###] "Area code 215"
Identify zip code "Zip code" [#####] "Zip code 46202"
Time "Time" or "Time" [location] "Time" or "Time in London"
Flight information [Airline] [flight number] "American airlines flight 390"
Calculator [A math phrase] "75 divided by 6"
Food [Type of food] or [Type of food] in [location] "Mexican food" or "Mexican food in Urbana, Illinois"